Our transportation system covers nearly every part of the valley. 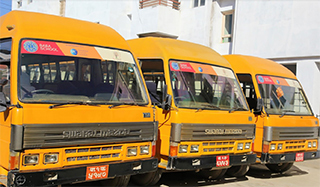 Every year, we review and reassess our routes so as to cater the quickest and most convenient route for our students. To ensure the utmost security for our students, we have a team of professional and disciplined drivers and helpers to manage the travel. We provide transportation for both day scholar and day boarding students. We also provide door to door van service for pre-school children. For safety reasons, students are always required to travel in the assigned school buses. The timing and route instruction is given during the time of admission itself.